I am proud to announce that my painting, "Eschaton" (at left) has been included as a finalist in the 2012-13 Art Renewal Center Salon. That's the main news. I'm very happy about the recognition. What is this salon, though? It may be new to you. The Art Renewal Center has long been a favorite destination of mine for inspiration, gathering the finest in classical painting over the past centuries, and continuing their support forward to the present-day, recognizing contemporary artists pushing the boundaries of skill, emotion and vision. They've advanced the value of objective aesthetics with the understanding that subjective appreciation still applies. A few years ago, they began a juried "salon" which results in an annual catalog, cash prizes, purchase awards, and promotion of contemporary works on their site. It's always been a refreshing reminder that not everything in the modern art world is silliness. Through their own lectures and efforts, they've championed classical aesthetics in a tone I might not go full on-board with, while largely sympathizing with much of the underlying philosophy. Nevertheless, I am happy to have them as co-belligerents, and I do believe organizations like theirs have resulted in a sort of renaissance of classical methods and atelier training, which I wish I had been a beneficiary of 20 years ago. But what of this genre I work in? In recent years it has acquired the category name of, "Imaginative Realism," a title which does no violence to the genre while sounding respectable enough to the cultured ear. I've often said that my genre is the bottom of the barrel in terms of cultured art, or rather that it is regarded as such. I would argue that there are many works produced from its ranks that can stand shoulder-to-shoulder with the best of any genre. And there is plenty of schlock. But it would be like denigrating our best landscape painters because thrift store landscapes exist and inhabit the same genre. In our minds, we rightfully chop off the worst from consideration, and weigh the best against the best. Except for Imaginative Realism, which is often left out of consideration at all, by many organizations and almost all museums and galleries. For this reason, I have been extremely excited to see recent trends beginning to show the stirrings of change. A year ago, the Allentown Art Museum hosted an exhibit of Imaginative Realist works, from classic illustration to works produced in the past couple of years. IlluXCon now has among its jury members leadership from not only Allentown but also the Delaware Art Museum. And now, the Art Renewal Center has opened its doors to us as well, creating a category for us to participate in its annual salon. What was interesting was seeing works from genre artists spread not only within the defined category, but spilling into other categories, as well. Because this genre at times touches upon portraiture, figure painting, landscape, wildlife art...almost anything. I've also said for a long time that the best in this field are in my opinion the best in *any* field, simply because the visual breadth necessary encompasses all fields of representational art. The best fantasy artist (to revert to the vernacular) will be a stellar portraitist, figure painter, landscape painter, architectural painter, and wildlife painter...all in the same painting at times. And then throw in the imaginative aspects which don't actually exist! Compare that to someone who spends their entire life only painting portraits (worthy and appreciated as that is). Do check out the salon results, and if you are the type who enjoys collecting art books and catalogs, order one from them. It would be a wonderful show of appreciation for their support for us, and you would get a 200 page catalog with incredible art from across the full gamut of representational painting. You can't go wrong if you love art. Did I mention that Eschaton is included in the catalog? Well, all the more reason to pick one up! Last week, I was a bit audacious in critiquing an acknowledged master. Part of why it was audacious is because Pyle was truly a wonderful illustrator, and a powerhouse of a paint slinger. The Delaware Art Museum has the largest collection of original Pyle artwork anywhere, Pyle having lived, taught and worked in Wilmington, where the museum resides. It was already on my list of museums to visit, for its Pyle collection, before this show. Learning that such a retrospective was going up, however, popped this up the list of things-to-do immediately. The show runs through March 4, 2012, so you have a couple of months left to get out there. And if it's in any way reasonable to do so, and you love this stuff, do so. Pyle was known as a remarkable historical-fantasy painter, illustrating stories and writing and illustrating others. The above shows a bit of that: multi-figured, costumed narrative. Pyle is one illustrator that definitely benefits from seeing the originals: his work is incredibly subtly colored, tending towards mid-to-low color saturation, with an astounding sensitivity to grayscale value. I often go on about the importance of value, even over color. Pyle was one of those who mastered both. His work is mainly tied to two main genres: pirates and colonial history painting. The more you look, the more you realize that movies like Pirates of the Caribbean drew heavy inspiration from Pyle's work. His pirate work has therefore remained popular, even as pirates themselves are a perennial subject of fascination in the culture. 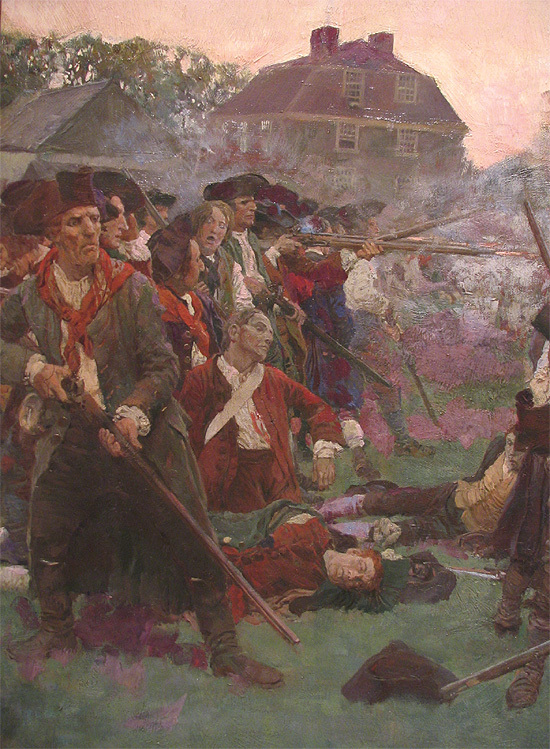 But his Revolutionary War era work is wonderful in equal measures. Is that John Kerry at left? Pyle had a wonderful ability to be both loose and tight at the same time, thick and yet detailed. The scumbling of smoke at right reveals a heavy impasto from either the priming or from under layers. Interestingly, these two pieces shown so far aren't even from the retrospective show! They are part of the museum's collection and currently hung in a separate show which runs all of 2012. Visiting now gives you a double helping of Pyle! The show itself features a number of Pyle's masterpieces, ones you will have seen posted everywhere else. And if you don't know Pyle's work well, then these should simply be considered appetizers for that stuff. What struck me most was the size variation of his work, from these roughly 24x36 -range pieces, which are typical sizes for illustrations even today, to ~40x60" for some of his more popular pieces, which benefited more from space than detail, since those largest pieces are often much simpler than the above. There are also a number of smaller paintings, even down to maybe 10x10" or so. Back in the day, it was common to find black-and-white reproductions in publications. Often, these were simply painted in black-and-white, and the show highlights a few of these. I haven't worked much in that format, but every time I see it it looks like fun. These black and white (or limited palette pieces) are lessons in value structure. At left, the values are stuctured so as to make you work a little, the opposite of much illustration these days, which needs to be instant-impact. And yet, the piece does have instant impact due to strong contrasts, filigree, and a halo/sun framing the head. Added to the billowy drapery, it immediately resonates as an "angel" painting, which makes you wonder where the wings are, and then you see it. It then dawns on you that it is neither a sun nor a halo behind the head, as such, but simply the shape of a bright light or sky that is peeking through the gap between two spread wings. Lovely, a trick I'm likely to steal at some point. The great thing about good monochrome art is that you can imagine the color palette as almost anything, and it still works. The painting below, for instance, could just as easily be a moody deep night scene, lit by moonlight, or an early morning light, bright yellows and purple in the shadows. Or evening, with oranges and blues. Or whatever, it doesn't matter. Perhaps equal to his reputation as an illustrator, possibly even greater--certainly of even greater lasting influence--was the private school he ran, bringing in students, teaching them, sending them out. The lineage here is astounding. Artists such as Frank Schoonover and Maxfield Parrish studied with Pyle. Other entire branches of lineage were launched through training N.C. Wyeth, father of Andrew, who became one of America's most celebrated fine artists. Student Harvey Dunn went on to train other celbrated illustrators as well, including Dean Cornwell, both of whom ended up training Mead Schaeffer. The cascading effects of Pyle's influence on contemporary illustration are astounding, and this is without naming the many talented illustrators who worked in their day after training with Pyle or his students, but whose names have not become so well-known. That influence has not ended, to this day. Whether directly influenced by Pyle, or by one of his artistic progeny, today's illustrators working within this genre are direct inheritors of this genius. No one denies it, and all celebrate it. The amount to which I or another directly embody the influence varies, but it's inescapable. You cannot see a painting like the one at top, and then see Mark Zug's work and not see Pyle and Wyeth all over. The Hildebrandts, too, in their earlier fantasy years. Howard Pyle (L), Darrell Sweet (R) Not a coincidence. "But I live far away, Randy, and can't get to Wilmington DE!" Well, the show catalog will have to suffice. It's good, overall, although Pyle's work in particular always suffers a bit from skewing to dark, or being overexposed. Many of the color plates however are good enough, a few excelllent. If possible, I'd like to take another 3-hour drive down myself to see it again before it ends. 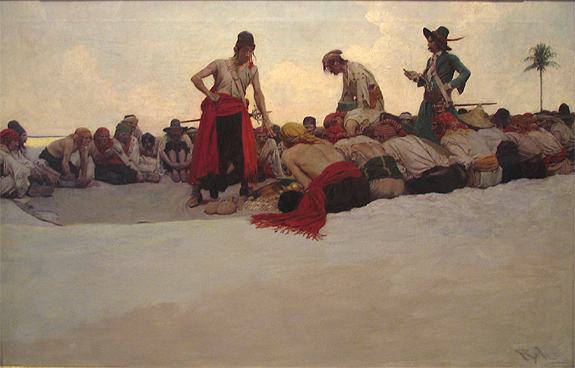 I recently had the wonderful opportunity of heading down to the Delaware Art Museum to see the "Howard Pyle: American Master Rediscovered" exhibition, in honor of the 100 year anniversary of the famed illustrator's death. I of course chuckle at the "Rediscovered" part of the title--who lost track of Pyle? Not I! But, I know what they mean--despite being the grandfather of American Illustration and the fountainhead from which poured forth some of this country's greatest painters directly or indirectly, he's not someone you run across in Art History courses. No, you'll spend much more time on any number of -isms of the period but you'll never hear Pyle or his school discussed. But illustrators know. Particularly, fantasy and children's illustrators know. We're inheritors of his school, after all. I'll be doing another post that gushes about Pyle's work, with more photos--because no book yet does the paintings justice. But this week, I'm going to do something unusual--I'm going to call out the Master on a blunder. That's pretty brazen, right? I mean, I could only hope to be as good, can only dream of having a fraction of the impact of Pyle. But, while there are some painters who seemingly can do no wrong (at least, technically), perhaps because Pyle was an illustrator, there are a few pieces that evidence some surprising oversights. I can only blame them on his being an illustrator with deadlines. Still, though, they did leave me scratching my head a bit, amid all the awesome. This was not part of the show mentioned, but part of another exhibit featuring his work in another context (the museum is the chief repository of Pyle's work). Already, this piece exhibits a lot of Pyle's excellent qualities. The composition is gorgeous, with the massed darks being relieved from claustrophobia through wonderful use of filigree in the upper left, which the composition launches upwards toward. The foliage rises from lower left to upper right. Just at the woman's bosom, and again above her left shoulder, the branches jut left. This new angle is picked up by the branches behind her, leading out of the image in the direction she's rising. The intense red and green contrast works because while he's chosen colors that are exactly complimentary to where they at times exhibit visual vibration--usually a bad thing--he's limited the amount of red. Had the piece been equally both, it would have been visual chaos. The peppering of red down the image, through the leaves, is wonderfully done--it's enough so the figure continues to read, it keeps the foliage from becoming an impenetrable wall, but doesn't distract from the top half. So after admiring it from a distance, something started calling out to me as odd. I began to walk closer. By repositioning the eye, it now basically matches the same diagonal axis that runs across the lips and the nostrils, and headband about the forehead. I will say that despite being overwhelmed by the exhibit, there were a couple other places in other paintings where some figure--usually a small background figure--was just poorly drawn. No two ways about it. Sometimes not even poorly as in wrong, but just lazily drawn in for someone of so mighty an ability, who in other multi-figure pieces could work with complete authority. The important thing to remember is that the Masters are not gods. Most had off days here and there. Because something is hanging in a museum does not mean you should look at it uncritically. And to point out an error is not hubris on your part, rather to not notice errors in your own work but to see them in others' is the dangerous trap. I hope I catch many of my errors after the fact, even if I miss them immediately. I know I have a long list of them that I hope no one else notices, some of which I've gone back and fixed either before handing them in, or sometimes even after getting a painting back. When visiting New York City, if art is on the agenda, there are places one will hit. The Met, for instance. But, on an extended trip, or perhaps on a second or later visit, the city is home to other destinations worth seeing. One of them is fairly unknown--The Hispanic Society of America. It's under the radar for two reasons. There's nothing to indicate that a place so named has a decent amount of very good art. Second, the location: up Broadway at about 155th St., the park is just over 2mi. past Central Park, past Harlem. There aren't many tourist attractions that far north. The HSA first got on my radar while living in Spain, where I reconnected with the art of Joaquin Sorolla, including visiting his once-home/studio in Madrid. I learned about this series, painted near the end of Sorolla's life, and occupying much of the last 8 years of it. "Visions of Spain" was a 12-14' x 227' series of murals, painted mostly from life, wherein Sorolla traveled throughout various regions of Spain, painting local traditions and customs, with folks in local dress. The whole suite was commissioned specifically for this HSA, in NYC. So, though I'd never been to NYC, I knew that a visit would be high on my list whenever I visited the Big Apple. I rave more about Sorolla in general elsewhere. This photo includes about 1/4 of the entire suite, which lines the room in one continuous arc. So, when we eventually moved to NYC two years ago (! ), and up in northern Manhattan to boot, one of the first things we wanted to see was this room. Just our luck, that wing of the museum was under construction, and the entire series was on tour in Spain, while construction was underway. It was the first time the paintings were on view in Spain, and the show was breaking records wherever it went...including Malaga, less than an hour from where we lived, although not while we were in Spain. Just this month, the paintings returned and were reinstalled, so within a couple of weeks, we hit it up. The canvases, as mentioned and shown above, are pretty huge. The painter himself was nearing the end of his life, but the work is a real labor of love, a riot of color, light and brushwork--all Sorolla's hallmarks. As you walk up on it, there are certain sections that fall apart, the brushwork of the sort that snaps together a few feet away, in a manner that makes it seem like he painted with a 6-8 foot long brush. Yet, other parts--particularly those portions that are the focal points, definitely stand up to closer viewing. I'd love to see the amount of paint expended here. Many portions were evidently painted with 1-2" wide brushes, thick slashes of paint laid down exactly, and left. For those who paint, who want to see a good example of the principle of thinly painted darks and thickly painted light areas, these are an education on their own. Culturally, it's also very interesting to see many traditional scenes before so much of it began being lost. This was before Franco, before WWII. Of interest was seeing the portrayal of the northern region of Galicia. For those who don't know, my surname Gallegos is simply the plural of Gallego, and Gallego is simply the adjective that means Galician. So though my lineage snakes through Mexico on its way to me, there is a clear geographical anchor for at least one section of my family tree. I've yet to visit the region, so it was nice to see. Some scenes, like Holy Week in Seville (L), can still be seen in today's Spain--I witnessed what felt like this exact moment 8 years ago in Madrid, quite by accident. It was haunting, so standing in front of this life-sized portrayal definitely brought it all back. It was also a great example of keeping color in what would easily be dark and drab scenes. There are flecks of color throughout even the dark penitent's robes, in the most unexpected places. Apart from this room, the museum housesworks by a basic who's-who of Spanish artists. This is a museum that won't demand your whole day--it's a good size for those who can't spend hours in museums. It also features a nice collection of Spanish crafts, sculpture and the like; the outside courtyard also has some impressive sculptures. So, now you know! If you're headed to the Bronx Zoo, Columbia University, or Harlem itself, the Hispanic Society should be a 1-2 hour stopping point on the way. Or, if you're like me, it's the end destination!